Do you love foosball? It is a game that you either get it or don’t – where more often than not, those with a quicker mind and reflexes tend to excel in it. 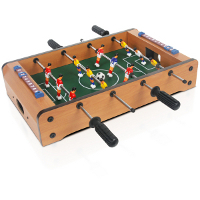 Most of the time you would find a foosball table at a pub or perhaps at an arcade, but why not bring home the foosball experience with the £19.95 Desktop Table Football? This specially designed foosball table by Peers Hardy requires nothing but a flat surface (in order to be fair, of course). Unlike a game of soccer that ends with the blow of a whistle after 90 minutes, the Desktop Table Football will require you to score 10 before your opponent, making it a nail biting experience especially when you think about the skill level that is on par between the two players. Well, it comes with just a couple of balls, so make sure you are extra careful not to lose them – but good thing the entire set is not that expensive to buy all over again assuming you happen to be clumsy with a ball that bounced out.